living and regular exercise. I love food, science, photography and creating new recipes. I started eating low-carb about 2 years ago, shortly after I was diagnosed with Hashimoto’s hypothyroidism. Since then, I‘ve been trying to figure out what works best for me and discovered some of the great benefits of low-carb eating. I follow a ketogenic diet plan using high-quality, organic, unprocessed food. I always opt for grass-fed beef and butter, raw hormone-free dairy and healthy fats like coconut oil. Many of my recipes are paleo-friendly and all of them are gluten-free and contain no artificial additives. The ketogenic diet helps me maintain a healthy weight while eating real food. My blog, KetoDietApp.com is all about sharing recipes and tips for healthy living. As a science geek, I base my views on valid research and I have first-hand experience of what it is to be on a low-carb diet. Both are reflected in my posts. Together with my partner, we developed iPad (KetoDiet) and iPhone (KetoDiet Basic) apps. I’m also the author of The KetoDiet Book for the Kindle. 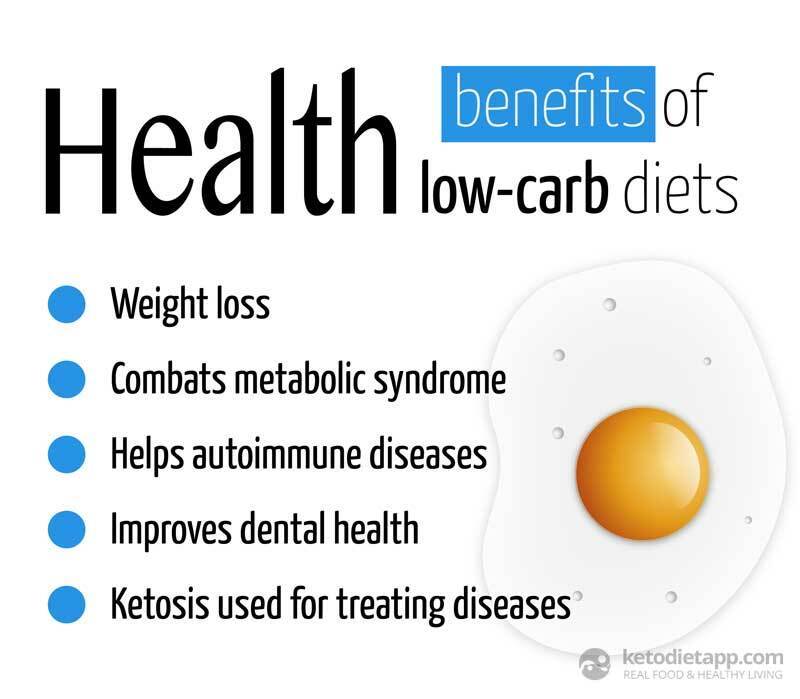 KetoDiet is for everyone who wants to follow a healthy low-carb lifestyle. Our mission is to help you reach your goals, whether it’s your dream weight or simply eating real, healthy food. No need for calorie counting, portion control, extensive exercise or feeling hungry. All you need to be aware of is the amount of carbohydrates in your food. Everything else will just follow naturally. The initial phase of low-carb eating may be difficult to stick to as you may experience symptoms known as “low-carb flu” or “keto-flu”. However, once you go through that phase, you will feel great and full of energy. Unlike calorie-restricted diets, low-carb diets have been shown to help preserve muscle tissue. As long as you eat adequate amount of protein, carbohydrate restriction will help you lose fat while preserving or even building muscles. The more muscle tissue you have, the more calories you burn. A study from 2004 has examined the effect of low-carb diets on blood sugar. Based on the results, blood sugar has decreased in individuals with diabetes and pre-diabetics. Another study from 2005 shows that low-carb diets decrease insulin and improve insulin resistance in obese patients with type 2 diabetes. Low-carb diets have been shown to improve cholesterol levels. Our body produces cholesterol in response to the type of fats we eat. Generally, if we eat saturated fats, our body produces LDL cholesterol, while it produces HDL cholesterol in response to the consumption of unsaturated fats. Studies have shown that carbohydrate restriction increases HDL cholesterol, which is linked to a decreased risk of heart disease. A 2009 systematic review of randomized controlled studies that compared low-carbohydrate diets to low-fat / low-calorie diets found that measurements of weight, HDL cholesterol, triglyceride levels and systolic blood pressure were significantly better in groups that followed low-carbohydrate diets. Another study performed by Dr. Volek and his team found that low-carb diet lead to significantly decreased level of triglycerides, which are linked to increased risk of cardiovascular disease. Finally, low-carb diets are often scrutinized for encouraging people to eat saturated fat. Let’s make this clear: The true reason for heart disease is inflammation, not saturated fat. There is no evidence that saturated fat raises cholesterol or causes heart disease. According to Dr. Briffa, the author of best-selling book “Escape the Diet Trap”, carbohydrates that disrupt blood sugar levels provoke inflammation and raise triglycerides. Eating low-carb, real food decreases inflammation in the body. Keep in mind that not everything labeled “low-carb” is anti-inflammatory. Food quality is crucial: artificial sweeteners, refined vegetable oils, char grilling or too much omega 6 all increase the level of inflammation. Low-carb diets, especially the Paleo diet, are recommended for autoimmune conditions such as Celiac disease or Hashimoto’s hypothyroidism. Note: While low-carb diets are generally beneficial, studies show that extreme carb restriction (below 20 grams of net carbs) may not be suitable for people with Hashimoto’s. Dr. Broda Barnes, who spent over 50 years on thyroid research, suggested in his book “Hypothyroidism: The Unsuspected Illness” that the minimum amount of carbohydrate intake for patients with hypothyroidism should at least 30 grams of net carbs. Sugar significantly alters the pH in your mouth – with less sugar intake, there is less risk of gum diseases and decay. Today, most of the evidence is based on the observations of Weston Price, an American dentist, who spent his life studying the diets of various cultures. It is generally accepted, that any diet below 130-150 grams of carbohydrates is regarded as “low-carb”. Ketogenic diets are a subset of low-carb diets that induce a metabolic state known as ketosis by restricting carbs to 20-50 grams a day. Based on studies, ketosis is a beneficial condition for treating cancer. When you restrict carbohydrate intake below 20-50 grams, your body runs out of glycogen stores and starts producing ketone bodies. Normal cells can use ketones for energy, but cancer cells cannot and they literally starve to death. Additionally, ketogenic diets have been used for treating: neurological diseases (Alzheimer’s disease, Parkinson’s disease, autism, depression, migraines, epilepsy), chronic fatigue syndrome, polycystic ovarian syndrome (POS) and more. 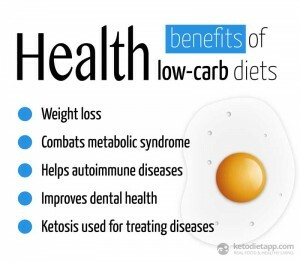 Low-carb diets have many proven health benefits. However, keep in mind that “low-carb” does not necessarily mean healthy. Food quality and cooking methods are as important as the amount of carbs you eat. It is recommended you first consult your diet plan with your doctor, especially if you are pregnant, nursing or having any health issues such as diabetes, thyroid dysfunction, etc., as there may need to be an adjustment to the medication you are taking. To learn more about low-carb living, follow Martina! Note: CeliacCorner also recommends to anyone who is considering following any type of specialty or weight loss Diet, to first discuss with primary care physician/nutritionist/dietitian. I love cheesecakes and autumn spices – they bring back memories of my childhood. 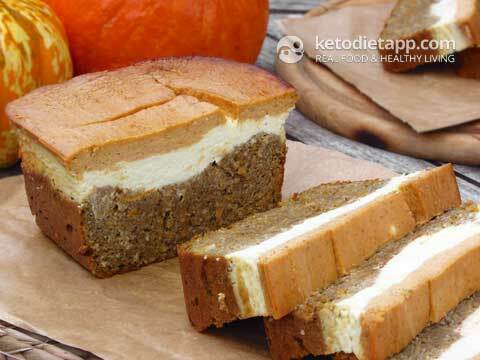 I created this recipe by accident when I realized I didn’t have enough almond flour to make my favorite pumpkin bread and used cream cheese for the topping. It ended up being the best mistake and it’s the only way I make pumpkin bread since then! One loaf makes 10-12 servings depending on the size of each cut. For better portion control, cut the loaf first in half, then in quarters and cut each quarter into 3 equal slices. If you don’t want to use the orange juice & orange zest, the net carbs per slice will be reduced to 5.1 grams. Also, instead of almond flour, you can use fine coconut flour (3/4 cup, 90g / 3.2 oz) + add one more egg + 2 tbsp heavy whipping cream. 1. Preheat the oven to 175 C / 300 F. In a bowl, mix blanched almond flour, cinnamon, ginger, nutmeg, cloves, cream of tartare and baking soda. You can also use a teaspoon of gluten-free baking powder instead of cream of tartar and baking soda. 2. In another bowl, whisk the eggs, melted butter, Erythritol and stevia. 3. Transfer the egg mixture into the first bowl with the dry ingredients and process well. Spoon in the pumpkin puree and mix in well. You can either use fresh pumpkin to make your own puree or use canned pumpkin puree. 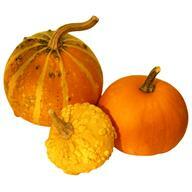 Note: Make sure you use BPA-free pumpkin puree with no added sugar. 4. Juice and zest half of an orange and add the peel to the mixture. You should only use organic oranges when using the peel. 5. In another bowl, prepare the cheesecake topping by mixing the cream cheese, egg, orange juice, Erythritol and stevia. 6. Add natural unsweetened orange extract, preferably propylene glycol-free. 7. 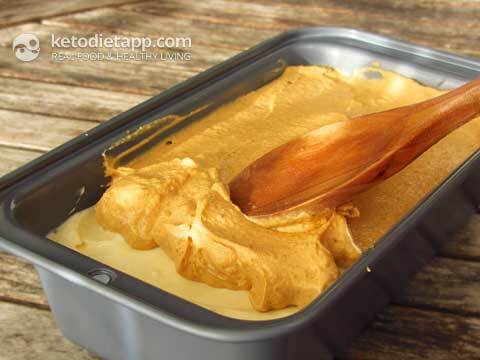 Spoon the bread batter into a baking dish suitable for bread and distribute evenly using a ladle. 8. Add a layer using half of the cheese mixture on top of the bread batter and spread evenly. 9. Mix the remaining cheese mixture with the pumpkin puree and cinnamon. 10. 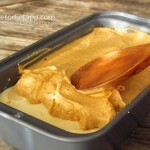 Gently spoon the pumpkin cheese mixture on top and spread evenly. Transfer into the oven with a water bath and bake for 50-60 minutes. Keep an eye on the bread, as it may get burnt on top. This recipe requires not only low heat but also moisture in the oven. The reason for using a water bath is to prevent the top of the bread from drying. Simply place another tray or a baking dish filled with a cup or two of water into the oven while baking the bread. 11. When done, open the door of the oven and let the bread slowly cool down. When it reaches room temperature, carefully remove from the baking dish and start serving! 12. Placing the bread in the fridge for a couple of hours or even overnight will make it firm and easier to cut. Hi! Thanks so much for sharing this article on Freedible. I follow a low carb diet to help heal an autoimmune disease (and several related autoimmune conditions) as well. Even with all my “diseases” I feel healthier and have more energy on a low carb diet than I’ve ever felt my entire life. I’m actually in better health than any of my “healthy” friends. I have been eating low-carb for about 1 year now and have lost weight and feel much better than ever. Enjoyed reading your article, some good info there, I’m beginning to cut out carbs one bowl of pasta at a time. The KetoDiet App Blog | Do you want to lose fat faster? Include coconut oil in your diet! The KetoDiet App Blog | Do you want to lose fat faster? Include coconut oil in you diet! AT the time of my celiac diagnosis I was overweight and I added even more pounds because I was still eating Glutenfree pasta and rice. I decided to limit my carbs and I have lost 10 pounds. Thanks for the helpful info as I plan to continue limiting carbs. Love the recipe, thank you.